Once upon a time, I never would have dreamed I would be sunning myself along a powdery, sandy beach in Poland. Yep, you heard right. Poland has some lovely beaches! This past weekend, we escaped to the beach since hubby had some time off for a national Polish holiday. Poles celebrate two holidays on August 15 – Assumption of the Blessed Virgin Mary (Wniebowzięcie Najświętszej Maryi Panny) as well as Armed Forces Day (Dzień Wojska Polskiego). The latter commemorates the Battle of Warsaw in 1920 in which Polish forces defeated the Bolshevik Red Army on the outskirts of Warsaw. At 5 a.m. Thursday, we hit the road for our apartment between the coastal towns of Gdańsk and Sopot, located along the Baltic Sea or technically the Bay of Gdańsk. I’m still saying we visited the Baltic Sea for the first time! Between these two towns and only five minutes from our apartment is a popular 4.5 kilometer-long stretch of golden beaches. Hundreds, perhaps thousands of Poles and other tourists, also were frolicking and sunbathing here over the holiday weekend. However, we didn’t venture out too far into the sea as the water temps were only 70 F (21 C). Brrr! Manicured beaches in the early morning. To our delight, the beaches are edged with charming little pubs and cafés here and there. We didn’t stray too far away from the beer tents. 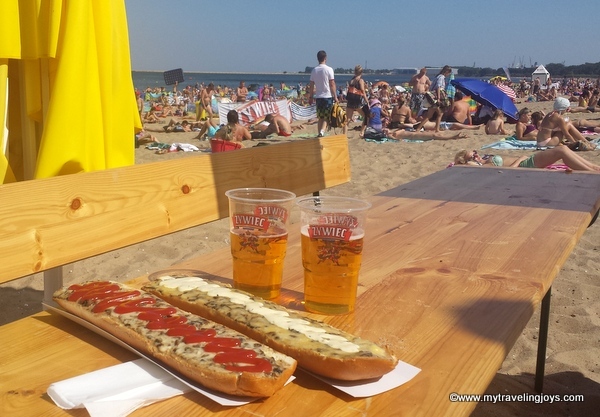 Classic Polish street food - zapiekanka (pizza on French bread) and Polish beer on the beach. As you get closer to Sopot, you will find sophisticated beach clubs and more upscale restaurants and bars if that’s more your thing. 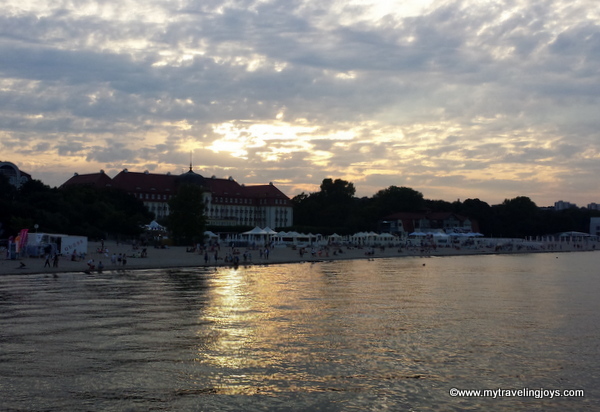 Sunset view of Grand Hotel, built in 1927, in Sopot. Our section of the beach, called Brzeźno, definitely seemed more laidback and family friendly. We easily found a spot for our beach mat and Turkish towels in the afternoon. However, we saw beach-goers arriving as early as 9 a.m. to stake out their prime spots by the shore. We didn’t spend our entire holiday on the beach as there were bike paths to discover, pastry shops to find and history to explore in nearby Gdańsk. But that’s another post. Brzeźno Beach can be easily reached by tram 3, 5 or 62 from central Gdańsk. We stayed at this modern, clean apartment on airbnb.com near Brzeźno Beach. In the background here, you can see the iconic shipyard cranes in Gdańsk. We can say that, in Poland we have everything, sea, mountains, lakes.. many places to visit. But all we are doing is complaining ;) unfortunately, the truth is, sometimes is cheaper to go to other country for holidays than spending holidays near Baltic Sea..
@Vixen, I have heard that from another Polish friend here in Warsaw. Maybe we got lucky as we have our own car so we drove and I found a good apartment to stay at via airbnb.com. For us, the trip was fairly economical - just a long drive with all the traffic Sunday night! what a wonderful trip. and zapiakanka too! can't wait to see the gdansk post! 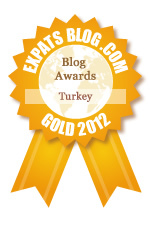 very inspiring post about trip to Baltic Sea!thank you! Baltic see is beautiful. I absolutely love Gdańsk, Gdynia. 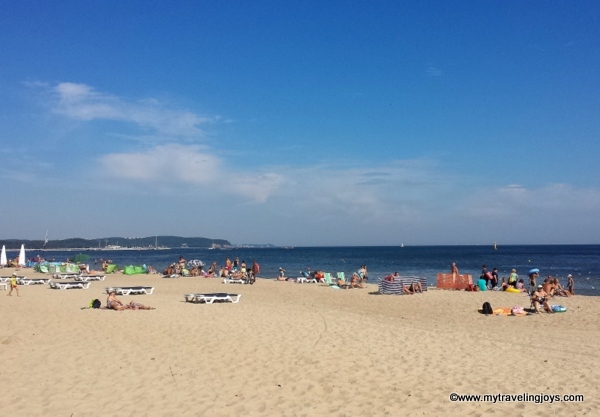 When you want to spend some time at the beach it is better to choose some different places - when the sand and water is cleaner - places from Wladyslawowo on east to Miedzyzdroje on west - then you have a contact with open see.